First cut a 4 1/4" x 11" piece of purple card stock and fold it in half for the base, a 4" x 5 1/4" piece of pink for the front, a 1 1/2" x 4" piece of purple for the strip's first layer, and a 4 1/8" x 5 3/8" piece of patterned paper for the strip. 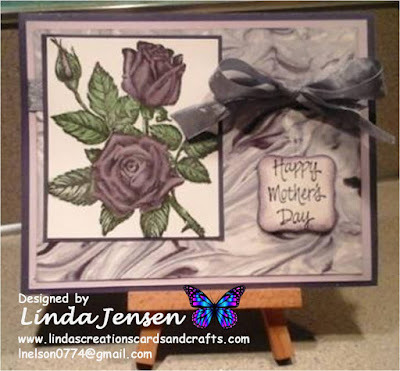 Next emboss the front with a Darice Easter Egg Background embossing folder and set it aside. Then cut the ovals for the bunny with Spellbinders Classic Ovals and Beaded Ovals dies. 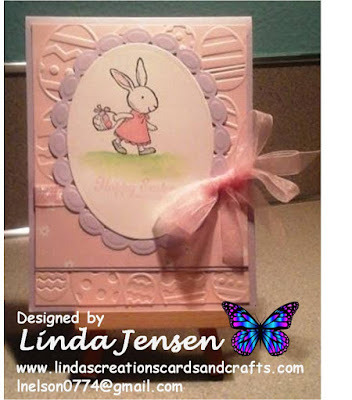 Next using a Stamp a ma jig stamp the bunny in Stazon Jet Black ink then color her with an aqua painter and Stampin' Up! Pink Pirouette, Wisteria Wonder and Wild Wasabi inks. Then again using a Stamp a ma jig stamp the sentiment in Pink Pirouette ink, attach the bunny to the beaded oval and set it aside. Next attach the patterned paper to it's first layer then to the front and attach the ribbon on the back of both sides. Next make the bow with a Mini Bowdabra (I love this sucker!!!!) and attach it to the ribbon with a bit of hot glue. Then attach the bunny to the front,the front to the base and enjoy!